Get your copy of Brain Power and Nutrition today! Order your copy of Brain Power and Nutrition today! Discover the “brain foods” that can reduce those “senior moments,” keep your mind sharper, and lower your risk of Alzheimer’s disease and other cognitive impairments. At its simplest, memory is the brain’s ability to store and retrieve information from location of house keys and addresses to how to drive a car or brew a cup of tea. And of course, memory is much more. It’s the experiences we’ve had, the places we’ve been, the people we’ve known. That’s why you want to keep your memory as strong, active and vital as possible. And that means keeping your brain healthy and fit. How? As with heart health, brain health is enhanced when you eat well and stay active. This Report shows you the powerful positive impact diet, nutrition, and physical activity can make in safeguarding your brain. In Brain Power and Nutrition you will discover specific foods, nutrients and vitamins that increase the brain’s ability to adapt to new information, that protect cognitive and motor behavior, ease mental effort, boost both long and short-term memory and lower the risk of Alzheimer’s disease and dementia. Brain Power and Nutrition shares evidence-based recommendations drawn from rigorously controlled studies. You’ll find out why “it’s the berries” when selecting brain-healthy fruit, whether fish is indeed “brain food” (it is—and you’ll learn the best choices), and why that second cup of morning coffee could be a “smart” idea. You will also be alerted to the single worst habit for brain health, how a low-carb diet can hurt mental abilities, and what best-selling supplement is no better than a placebo in slowing cognitive decline. In this empowering report, you’ll learn about an exercise routine that can actually reverse brain deterioration associated with aging. You’ll read how too little or too much sleep can spur cognitive decline. Plus, the editors offer five key strategies for implementing, and sticking with, your brain-healthy changes. 24 foods that are high in antioxidants. As we get older, we find that we don’t always hold thoughts as we once did. If you’ve ever forgotten where you put the car keys or can’t remember the title of that book you just read, you know the experience. Can you do anything about it? The answer is “yes!” Aging experts are now finding there’s a lot you can do to keep your memory sharp and your mind resilient. Like heart health, brain health can be fostered and protected with a wholesome diet and physical activity. 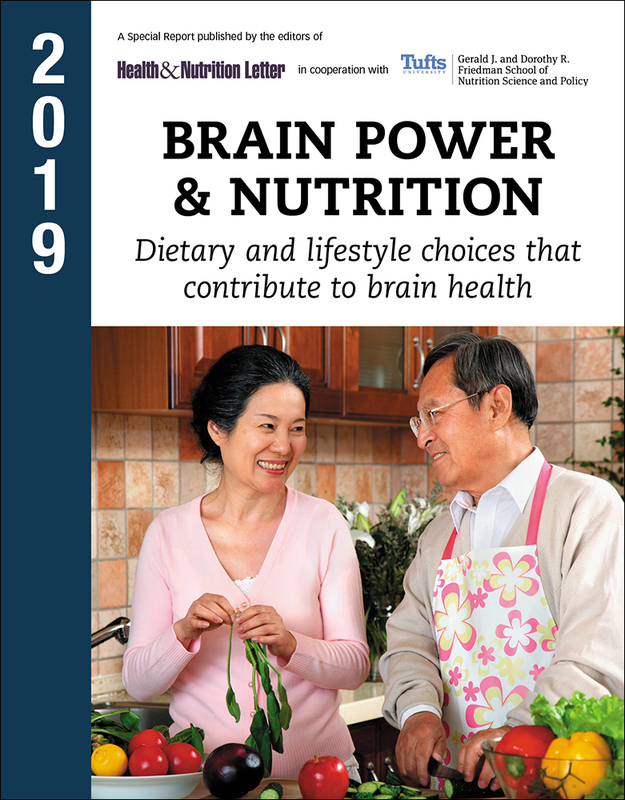 Brain Power and Nutrition shares the latest findings about those foods that offer lasting benefits in keeping the brain fit, in maintaining vital neural pathways, and reducing the risk of cognitive impairment and Alzheimer’s disease. Plus, you’ll read about those lifestyle changes—from exercising more to stressing less—that can improve your mind, mood and memory. Brain Power and Nutrition is available to you at the lowest price you’ll find anywhere. The cost is a very small price for information that can make such a large difference in your life or that of a loved one. Order today and if the report doesn’t match your expectations, let us know and we’ll fully refund your money, no questions asked. Let the nutrition experts at Tufts show you the “smart” eating choices and diet plans that can fortify your mental agility and protect your powers of recall. So, come and get it! Send for your risk-free copy of Brain Power and Nutrition today!